Times are indeed changing in Samoa, and from what we’re seeing today, it looks as if problems galore are waiting up ahead. That way, it looks as if the right thing to do now is slow down, and let caution be our guide. The point is that on the front page of the Samoa Observer of 12 April 2018, the story title “Govt, sacks Village Mayor”, was published. The story said Autu launched his attack on Dr. Sa’ilele after the Ministry of Women Community and Social Development, had terminated his services as Village Mayor, after he had been servicing his community for nine years. Still, the fact of the matter is that much has been said about Prime Minister, Sailele Malielegaoi, as being a dictator but then as far as we’re aware, there is nothing to show that he is indeed, a dictator. This is to say, a dictator kills people indiscriminatingly; in other words, neither a word nor a question is asked, and if others are objecting and they’re standing in the way, the dictator will kill them too. Still, we sympathise with the Village of Luatuanu’u and their Mayor, Autu Lolesio Tauili’i, since we know what its like to be attacked by our Prime Minister, Tuilaepa. But then, perhaps comparing him to Hitler is perhaps a bit too much. Still, let’s hope the harm caused will soon be mended, and hopefully then life will be less demanding of us all. And now, as if quarrelling among public servants has become a permanent preoccupation in today’s day and age, we’re reminded of the story that appeared on the front of the Samoa Observer on 26 April 2018, titled Minister of Justice denies removing Court files claims. The question then is: Why were the files removed from the Court and taken to the Office of the Minister of Justice and Courts Administration? Mr. Pio told the Samoa Observer: “I took the boxes of files to the Minister’s Office, I was escorted by the C.E.O.’s Secretary. “When I reported this matter to the Chief Justice, I told him that I was instructed by the C.E.O. to take these boxes of files. Now the question is: Why did Tulima Pio say he thought this was wrong? 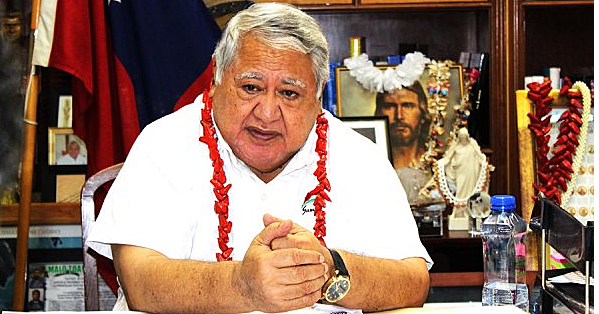 Mr. Pio also said he gave the Samoa Observer a document that lists the names of 10 Land and Titles Court files that were allegedly removed from the Court and taken to the Minister’s Office in October 2016. Later though, Mr. Pio said he’d delivered the files in 2016, upon instructions from his superior. Mr. Pio said he has worked at the M.J.C.A. for six years and he’s never seen anything like this being done before. Ah! The Head of State! What’s the problem with the Head of State today? On the front page of the Samoa Observer of 28 April 2018, the headline read: “He signed the law,” Acting P.M. hits back at former Head of State. The Acting Prime Minister here is Fiame Naomi Mata’afa, and the Head of State, is the former one, Tui Atua Tupua Tamasese Efi. So what’s going on between these two now? Well, according to Fiame, Tui Atua had signed a law. But then what law she was talking about, she did not say. Later though, it was explained that the law Fiame was referring to, was the Land Titles Registration Act 2008, which she claimed Tui Atua had signed when he was the Head of State. Still, it was there that Tui Atua had warned about the wording of Article 102 of the Constitution, saying it was ambiguous. He said he feared that this could be negatively exploited and could lead to the alienation of customary lands. As for Fiame, she said she was referring to the Land Titles Registration Act 2008, which was signed into law by Tui Atua, when he was the Head of State. Tui Atua said he had asked for clarity on the matter when he was given the L.T.R. Bill 2008, to sign. The advice was given in a letter from former Attorney General, Aumua Ming Leung Wai. Tui Atua said it was with this assurance that he signed the bill. Asked for a copy of the letter from the former A.G. Aumua, Tui Atua said he could not find it. Aumua has reportedly told the media the advice he’d issued at the time is confidential and could not be released. And so it dragged on. Still, even with all these laws, poverty is here to stay. The point is that Samoa, in our view, is a country that will never be able to rise from the dregs of austere poverty - especially in the villages - since those in the government who are entrusted with the task of helping to alleviate poverty, are instead enriching themselves with the resources that are being made available for this very purpose, to the point when poverty becomes uncontrollable and then along the way, it becomes a dangerous liability. And that is what the government should remain focused on.